CSR Gyprock has added Pro-Repair 10, a fast, all-purpose solution, to its nation-wide range of high-quality compounds. 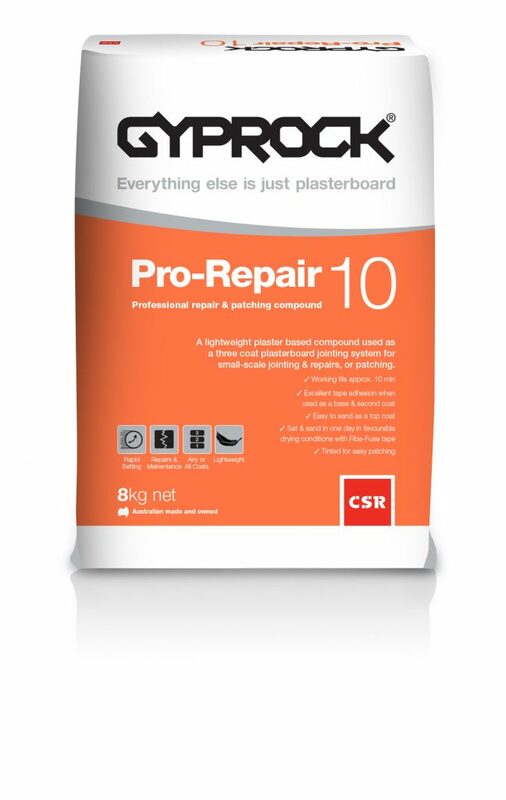 Named Pro-Repair 10 due to its 10-minute working time, the compound is suited to small-scale jointing jobs, patching holes and defects in Gyprock plasterboard and Cemintel fibre cement. It is also tinted for easy identification on painted surfaces. Pro-Repair 10 is a setting compound with a defined working life of approximately 10 minutes after mixing. This makes it ideal for repairing holes, nicks and cracks in new and existing plasterboard and fibre cement walls and ceilings. It also provides excellent coverage, with eight kg of Pro-Repair 10 providing approximately the same coverage as 10kg of standard weight compound. The multi-purpose nature of Pro-Repair 10 means that it can be used for any or all coats: as a base and topping coat, or as a base only. It also provides excellent tape adhesion when used as a base and second coat, and is easy to sand as a top coat. When Pro-Repair 10 is used for all three coats with a fibreglass, open fibre jointing tape such as FibaFuse, it is possible to sand the top coat on the same day, after sufficient drying time. "This means it is possible to complete all three coats and sand in one day, a huge bonus for time-poor tradesmen as they don’t have to wait around for it to dry or return the next day for another coat,” says Green. Pro-Repair 10 is available nation-wide at Gyprock Trade stores, Bunnings and specialist distributors.